Larry Rosen was born with the clothing business in his blood. It's not surprising, as his father, was Harry Rosen, founder of the famous Canadian men's retailer, founded in 1954. Daniel Eckler Founder of MIJLO - simple solutions for small spaces. Canadian Style Icons is a bi-weekly column authored by Daniel Eckler, serial entrepreneur and founder of Piccsy. Rosen grew up as his father's clothing empire was growing, and spent summers as a teenager learning to sell on store floors, just like any other clerk. Afterwards, Rosen would get his Bachelor of Arts from the University of Toronto, before earning an MBA and Law degree from Western. Rosen wouldn't go into the family business right away, first joining a corporate law firm in Toronto. In 1985 however, Rosen would join the company founded by his father and uncle. Larry started as a buyer, learning to understand the clothes that he'd be expected to sell. He moved on to become a General Merchandise Manager, then Director at the company. Larry would become President and Chief Operating Officer in 1997, before becoming Chairman and CEO in 2000. It's clear that his father's dedication to customer service, and giving people the best they could, left an impression on the young Larry. Larry can tell you a story about how his father once left a board meeting to personally attend to a customer who complained about the socks he had bought. That kind of dedication to what the customer wants is evident in Larry pushing for the company to adopt a new customer relationship management system, modelled on the old one his father had used since the 1950s. Notes on what customers had purchased would be kept by Larry's father, so he could build meaningful relationships with repeat customers. Other sales clerks at Harry Rosen would adopt the same system, and the computerization of the system, under Larry, modernized it all. What all this means however, is that Larry understands that the core of his business is giving customers what they want. And what they want, is cutting edge fashion, and customer service. 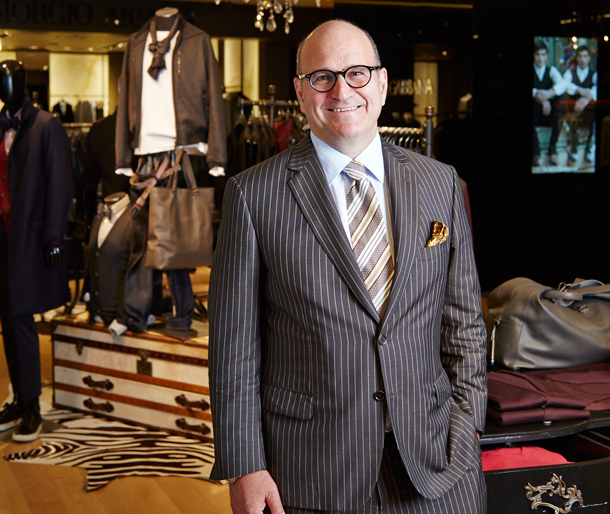 With the growing interest in haute couture, especially among men, Harry Rosen Inc. has grown to be one of Canada's fashion giants. Seventeen stores nationwide, and a robust e-commerce side give Canadian men access to the best in worldwide fashion. While the company Larry's dad built still carries old standbys like Versace and Hugo Boss, buyers at the company stock shelves with modern brands like J. Lindeberg, Citizens of Humanity and Stone Island to give Canadian men the goods to compete on a style stage with anyone in the world. But if you strip it all away, both Rosens understand that it's a company based around relationships with people. That's why Larry Rosen is a CEO who can say "Confidence and feeling good about yourself is important. And I want that to emanate from my customers." That's why Rosen can still occasionally seen at the Harry Rosen store on Bloor, helping customers. What is your definition of style? And good style? The whole purpose of style is to say something about yourself. It's how you want the world to see you. Are you creative, dependable, or serious with a fun side? What aspect of your personality do you want to reflect? Good style is when the choices reflect the inner person. I choose everything, even my glasses, to reflect how I want the world to see me. I perceive myself as a serious and creative businessman, with an unpredictable sense of humour, and I try to dress accordingly. I'm in perpetual motion. I like to have a lot of different items in my wardrobe. Style is important because people don't really listen. Most people are visual. You can speak volumes without saying a word, if the style choices you make reflect yourself accordingly. What makes someone a style icon? People don't make themselves icons. Consensus is developed overtime by the world that a certain person reflects style -- like older icons such as Carey Grant or David Beckham and Justin Timberlake today. How do you describe Canadian style? Canadian style is actually quite sophisticated. It's a unique marriage of European sensibility and American brashness. Together, this developed into something quite distinct.